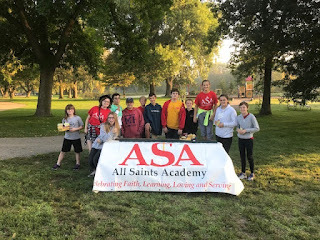 8th grade at All Saints Academy starts of each year with 4 special events tied to our 4 Core Values to kick off their "leadership year!" Faith: The 8th grade class retreat in the fall focuses on The Paschal Mystery and verse the class has selected as their theme for the year. "we have so many great memories about ASA!" "dying to self means we must make small sacrifices for others"
Learning: Student spend time working with Mr. Matlak and Mrs. Zimelis to set a series of goals for their 8th grade year that they share with parents during a special meal after camp. 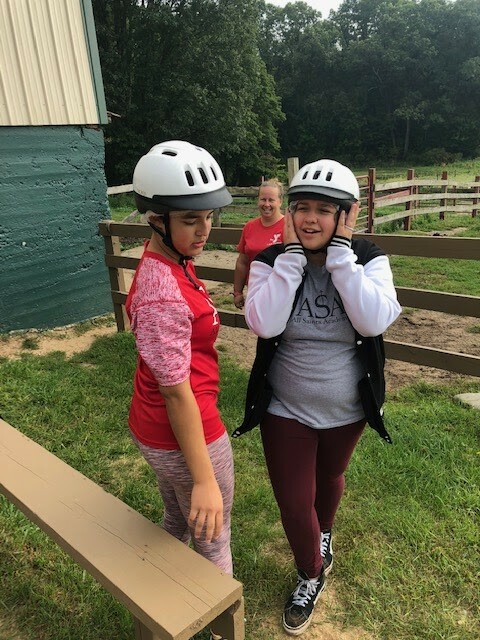 Loving: Students spend a day at Camp ManitouLin practicing team building skills to develop bonds and habit of encouragement as they support each other through challenges throughout the day. "sometimes you just have to trust your friends"
"overcome fears and do what seems scary because I may end up loving it"
Serving: Students are invited to help serve at the Lake Michigan Credit Union Bridge Run by manning an aid station in Riverside Park on and early Sunday morning in September! Bucket Fillers at Weekly Mass! These following four students were brought up to the altar so that their stories could be shared with the entire school community. When Mrs. LaPonsie came to pick up Kyle to have his tooth pulled at the dentist, Amelia stopped in line and turned to give Kyle a hug and wish him good luck. This kind bucket filling action inspired the rest of Kyle's friends to also give him hugs and well wishes. It really made Kyle feel special and confident heading into his appointment. Amelia and all the first grade friends filled Mrs. LaPonsie’s bucket too in their kindness. Harry heard Lucas ask his teacher to help tie his shoe. Harry jumped right in and said, "I can help you". He worked and worked on the shoelace which happened to have quite a few knots in it, but couldn't get it tied. Mrs. Bowman ended up having to tie the shoe but Harry really stepped up and did his best to help! Mazie fell in the hallway on the way to recess. Fletcher got out of line came back and asked if she was ok. He stayed until she got up and was able to go outside. A student arrived back in the classroom after we greeted each other at morning meeting, Mason reached his hand very politely toward the student upon his return and made sure he was greeted saying, "Good Morning Elijah". Elijah of course returned the greeting! Please join us for Mass when you can. We celebrate every Wednesday at 10:30 in Blessed Sacrament Church. 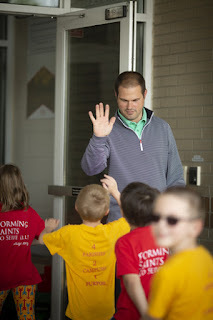 Did you hear that our own Mr. Debri was honored this past summer at the University of Notre Dame for his commitment to Catholic Education at All Saints Academy? Take a few minutes to read the inspiring story written by Audrey Scott from The Alliance for Catholic Education at Notre Dame to celebrate this award and share a little about Mr. Debri's "why!" 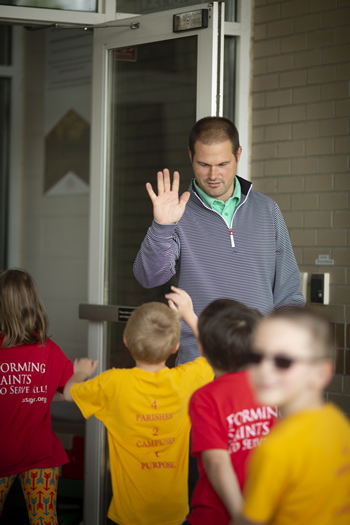 Do you have what it takes to be a Saint? "Education has the ability to change the trajectory of someone's life, and Catholic education can change the trajectory of your soul." We Are One Community of Math Learners! 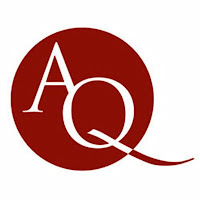 We are excited to share that we have entered into an "Adopt a School" partnership with the Aquinas College Mathematics Department! Professor McCarty and her Elementary Math Methods class are meeting at the middle school on Wednesdays this semester. The class meets at 9:00 in our Middle School Spanish Classroom to discuss course work. Then they join our 4th, 5th & 6th grade math classes at 10:15 for 1-on-1, or small group supports. AQ students will also create special interactive math stations for teachers to incorporate into our math programs! 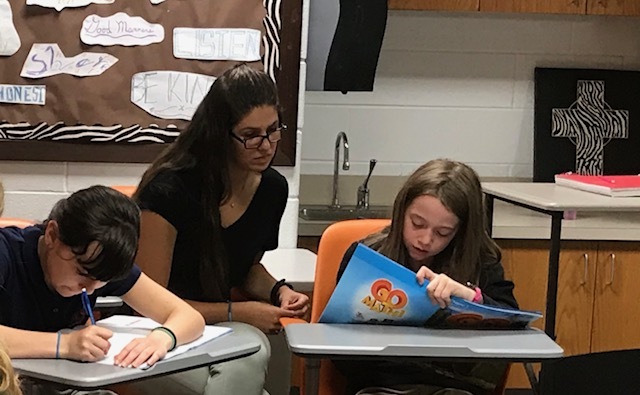 This mutually beneficial learning opportunity allows pre-service teachers to get hands-on experience learning by collaborating with our teachers. It provides our students with an additional layer of individualized support. It also enhances coaching opportunities for our teachers through their collaboration with Professor McCarty and our friends from the AQ Math Department! We are excited about continuing to develop this partnership with Aquinas College beyond this semester!